UNITED NATIONS, May 26 -- Since Ban Ki-moon has been UN Secretary General, he has said little to nothing about matters in the purview of the Security Council, and even in the face of the slaughter of tens of thousands of civilians he has merely urged caution and restraint, not even a ceasefire. 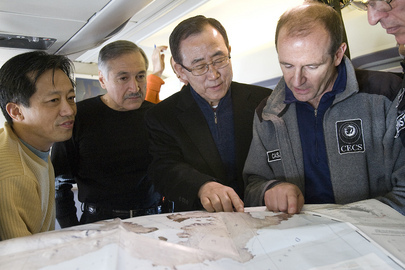 Then, when a South Korean ship is sunk killing 46 sailors, Ban Ki-moon comes out on the side of his native South Korea, calling the evidence against North Korea troubling, and urging the Security Council to take action. While Ban had tried to say that though it is his "homeland," he will try to be objective, it is worth comparing his reaction to the killing of thousands of civilians in Sri Lanka to the killing of 46 South Koreans military employees. The UN's own reports about Sri Lanka, as leaked to and published by Inner City Press, enumerated thousands of civilians killed by the government. Still Ban Ki-moon never called for Council action, nor for a ceasefire. On 46 South Korean deaths, Ban accepts a non-UN report as definitive truth, and calls for Council action. Inner City Press: it may be on this theme of prejudgement, but some have questioned whether the Secretary-General has viewed the statements of the Republic of Korea and of the Democratic People’s Republic of Korea sort of equally in the sense of like South Korea said this ship was sunk by North Korea. North Korea has said “we deny it”. Countries have taken sides and said that “we side with North Korea”, I mean, excuse me, with South Korea, we believe them. Some other countries have said, let’s wait and see. Spokesperson Martin Nesirky: Which countries? Inner City Press: For example, China. China has said “let’s wait and see”. So, I guess my question would be, I mean, one, does the Secretary-General, does he view the statements of Republic of Korea and Democratic People’s Republic of Korea equally? Has he, as some say, sort of taken sides in the matter? And reached a conclusion? Spokesperson: Well, first of all, let’s be very clear on this. This investigation and the results of that investigation, this is not simply an investigation done by the Republic of Korea. This was done by an international group of investigators, including 24 non-South Korean experts. This was an extremely thorough investigation, and the Secretary-General was extremely cautious waiting until the results of that international investigation had been announced. So it’s not as if he jumped precipitously into this. And he waited to see what the results of what was clearly a serious and objective investigation into a serious incident. And of course, it’s the Secretary-General’s duty to be objective; but not to sit on the fence on all issues. And you know very well that he has expressed — he consistently expresses — strong concern on any number of worrisome events taking place in many different parts of the world. And he does that frequently. That’s his job. And this is a very serious situation. Inner City Press: Well, just one follow-up. He seemed to say in his press conference that he has confidence that the Security Council will take measures appropriate to the gravity of the situation. This seems to prejudge that the Council will in fact take the matter up, whereas in other circumstances he says it’s totally up to the Council to take, I mean, I am just wonder… I am just asking because I think questions are out there. But is he assuming that the Council will take it up? Is he expressing a preference that the Council take it up and issue either a presidential statement or a resolution? Spokesperson: He has made his views clear on that, and I don’t need to repeat them here. Inner City Press: So I mean, he has power under Article 99 to actually raise things to the Council. Is that something he would…? Spokesperson: They can intend to take it and I think you’ve heard at least one permanent member of the Security Council saying that they would support the Republic of Korea in doing that. UNITED NATIONS, May 19, updated -- On the sinking of South Korea's ship Cheonan, the proverbial other shoe dropped on Wednesday evening, New York time. The South Korean government formally accused North Korea of sinking the ship with a torpedo, and killing 46 sailors on board. The finding had been telegraphed the day before by South Korea's foreign minister, who said there was little doubt that North Korea did. Inner City Press: Can I ask about [the Democratic People’s Republic of Korea]? I am figuring you will have an if-asked on this one. The Foreign Minister of [the Republic of Korea] has said that there is little doubt that [The Democratic People’s Republic of Korea] is responsible for the sinking of that ship and the killing of the sailors. What is the Secretary-General — given his interest, obviously, in the peace in the peninsula — what does he, does he have any comment on that? Spokesperson Martin Nesirky: He has obviously been following this situation with concern and he has seen the comments reported in the media today. We will have to await the official report, which is expected to be forthcoming tomorrow from the Republic of Korea before we can make any further comment. 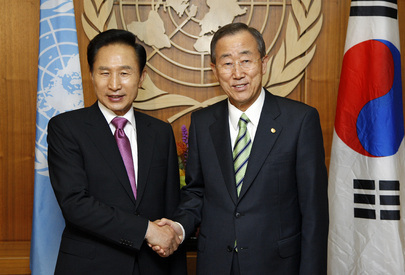 On the morning of May 19, Inner City Press asked Ban Ki-moon himself about Korea, albeit about reports that the UN Special Rapporteur on Freedom of Expression Frank La Rue said he was tailed around by the country's intelligence service. I have seen the press reports, Ban genially answered. Then he gave a pun-laden talk about distracted driving. Later on May 19, after 6 p.m., Nesirky was seen in the UN's new North Lawn building with Ban's top political advisor, the American Lynn Pascoe. And so, when South Korea made its announcement and the White House in Washington already had a statement out, Inner City Press asked Nesirky for Secretary General Ban Ki-moon's response. The Secretary-General has learned of the results of the investigation into the sinking of the Cheonan naval ship of the Republic of Korea with a heavy heart and serious concern. The Secretary-General appreciates the restrained and patient efforts of the Government of the Republic of Korea to investigate this incident in an objective and scientific manner by both domestic and international experts. The facts laid out in the report are deeply troubling. As Secretary-General of the United Nations, he will continue to closely follow developments. The Secretary-General takes this opportunity to express once again his deep sadness over the loss of the sailors. He also extends his heartfelt sympathy to the bereaved families as well as to the people and the Government of the Republic of Korea. Some might contrast Ban's call for an investigation of 46 deaths by "international experts" with his reluctance, even in the face of calls by the International Crisis Group, Amnesty International and Human Right Watch, to call for any outside review of the killing by the Sri Lankan government last week of tens of thousands of civilians. Others might point out that this is a cross border incident, not as Ban seems to view Sri Lanka's bloodbath on the beach, a merely internal matter. But what steps, really, can or will be taken on North Korea? The U.S. is said to want to keep Kim Jong-Il in power, at least for now, for fear of unknown forces gaining control of Pyongyang's weapons. 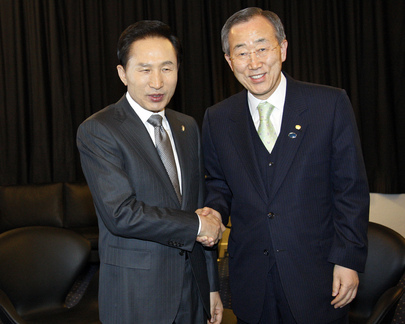 Ban Ki-moon earlier this year dispatched his senior advisor Kim Won-soo and Pascoe to North Korea. They came back with surprisingly upbeat reports about the potential for rapprochement. And now? On the morning of May 19, Inner City Press asked another of Ban's spokespeople, with even great knowledge of Korea than Mr. Nesirky, who covered the Peninsula for Reuters, if Ban would consider raising the matter to the Security Council pursuant to his powers under Article 99 of the UN Charter. No, was the answer. Inner City Press has sought confirmation and explanation from Nesirky, but at press time it had not yet been received. Watch this site. Inner City Press: can you confirm that the Chief of Staff, Vijay Nambiar, did write a letter to the Council when this issue first came up, and can you say whether the Council responded? It just seems strange that you have… when you say “your office”, was there a response made to the Executive Office of the Secretary-General, saying that they could enter but your Office could not, as we understand it? Spokesperson Nesirky: I would simply repeat what I have said. My Office has not been directly informed; this does not mean — and I have said it here, too — this does not mean that we have not been trying. And when I say “we”, that means the Executive Office of the Secretary-General as well, trying to understand and to have a clear answer. But I personally have not received a clear answer. It is hard to think this will be helpful for this Secretary General to raise or monitor the North Korea -- or DPRK as Nesirky is always quickly to point out -- issues in the Security Council. Watch this site. "At this stage I would add that we need to follow developments closely before we make any further comment - the findings are only just out." Meanwhile in Beijing the vice foreign minister of China has called the sinking "unfortunate," but has similarly declined to address the specifics of South Korea's report and accusation. Watch this site.